Every day, we at the Silver Dollar City Attractions blog learn something new about the visiting craftsmen who are gathering at Silver Dollar City for the National Crafts & Cowboy Festival. Presented by Humana®, this limited-time fall celebration features more than 125 crafters from all over the country who have arrived at The Home of American Craftsmanship to show off their skills. Their artistry is one of the main reasons Travel & Leisure named the event the Best Fall Festival in Missouri. With so many crafters to watch, where do you start? To help you plan your visit, we’re profiling a few of the most interesting craftsmen you can meet during the festival, which continues Wednesdays through Sundays through October 27. If you’ve missed the first three articles, click here to get caught up: Part 1 | Part 2 | Part 3. When you’re all set, continue reading to meet three more incredible crafters who specialize in sculpture, jewelry and basket making. Though she never touched clay until she was in eighth grade, Nancy Fairbanks quickly fell in love with it. She enrolled in every pottery class she could possibly attend, often arriving at high school early and staying late to hone her skills. Over 35 years after first touching clay, it’s still her preferred medium. While it’s technically correct to call Fairbanks a potter, that’s only a fraction of what she does. Pottery typically refers to functional work like plates, mugs and bowls. She does make some of those things, but that’s only a small part of what you’ll find in her booth on the Square. You’ll also discover sculptures, and a whole lineup of artwork that has been finished with different firing methods, including ones popular in Japanese and Native American cultures. “I like to do things that are out of the ordinary,” she said. To illustrate that point, Fairbanks’ booth contains several photos of her holding baby black bears. Though Fairbanks is from Grand Island, Nebraska, she often visits Oklahoma to see her sister, who works as a wildlife biologist. Part of her sister’s job is to conduct welfare checks on black bears, heading into dens at key times during the year make sure the mother and any newborn cubs are adjusting well. Fairbanks gets to hold the cubs, still small enough to fit comfortably in her arms, and keep them warm while her sister and team tend to the mother. Fairbanks will typically bring along some bags of clay and has the cubs make imprints with their paws, which she’ll then use in products that line her shelves. Now in her sixth year of the festival, Fairbanks has started incorporating Silver Dollar City into her artwork as well. She has cat-inspired coffee mugs with whiskers that are actually guitar strings that were once used by the Sons of the Silver Dollar, and vases with leaves that fell from the trees across park. Fairbanks will be on the Square through October 27. By her own admission, Mary Jo McCarty never stops searching for new crafts to learn. She can braid rugs, work on upholstery, crochet and decorate wedding cakes — and that’s hardly an exhaustive list. “Once I learned how to make a basket, I hardly do any of those other crafts anymore,” McCarty said. The Washington, Missouri, resident is now in her 16th year of demonstrating basket weaving at Silver Dollar City. She shares a space with her husband, Pat, a blacksmith near Hannah’s Ice Cream Parlor. Mary Jo handles the weaving while Pat creates iron handles, which aren’t often seen on baskets. That touch not only sets Mary Jo’s baskets apart, it gives her a chance to make a product with her husband. Mary Jo also enjoys that she gets to spend her days at Silver Dollar City weaving full-time, which is something that she doesn’t get the opportunity to do back home. The park provides a break from the chores of everyday life, and it gives her time to experiment with different colors, shapes and sizes. She’ll be at the park through October 27. The first time Ronney Williams saw someone who made spoon jewelry, he wasn’t impressed. He liked the concept of taking vintage or antique flatware and turning it into bracelets and rings, but didn’t like the execution. He knew he could provide a higher quality of craftsmanship than what he saw. “We set out from the beginning to take it to another level,” Williams said. 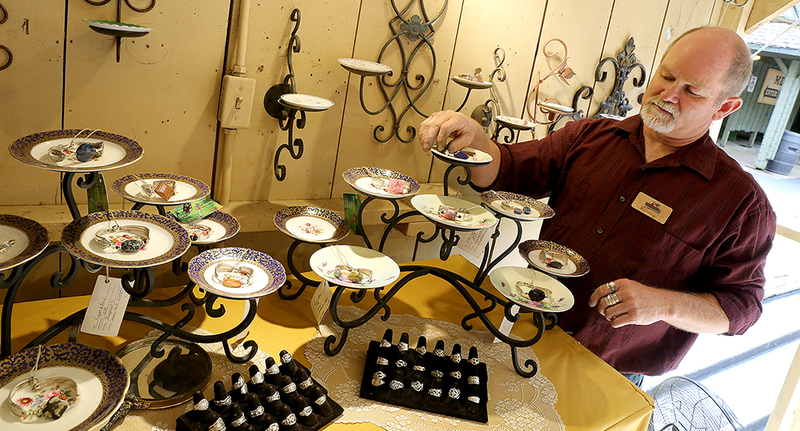 The Stillwater, Oklahoma, resident started traveling to antique stores and flea markets in search of old flatware. He bent and cut them into bracelets and rings and added stones like amazonite, ruby and jasper. The reviews were overwhelmingly positive, and that inspired him to start selling at craft shows. Before long, he was attending about 30 shows a year as a complement to his main income from his automobile business. It wasn’t until he first came to Silver Dollar City’s fall festival five years ago that he realized that making jewelry could be his full-time job. “I enjoy it more than anything in the world,” he said. Williams has a degree in history, and tries to tell his guests as much about each piece of flatware as he can. Tags attached to most of his items contain information about the year the spoon or fork was manufactured, the type of pattern that was used, and the kind of stone added to the end product. About 25 percent of his business now comes from guests who will bring him their own flatware and ask him to create something out of it. He also gives guests the opportunity to pick a spoon for a custom ring. “When a lady walks up, picks up something I’ve made and enjoys it, there’s no better feeling,” he said. Williams has a booth on Hugo’s Hill Street near Flossie’s Fried Fancies through October 27.